ChiIL Mama : Happy First Day of School to My Fav 4th & 6th Graders!! Happy First Day of School to My Fav 4th & 6th Graders!! Yep....believe it or not, it's that time of year again. All Chicago Public Schools on Track E went back today, to a new, longer school day. I've taken an annual 1st day of school photo since the kids were 3, and despite the rain, today was no exception. The kids patiently posed for their "mug shots" as I asked them to face forward, profile, and turn around to get those new backpacks bulging with school supplies! Sage almost fell over, and as strong as she is (70lbs of pure gymnast muscle) she said, "This is too much for my little body." Thankfully much of it won't be traveling back and forth. The towel rolls and Kleenex, cleaning supplies, and reams of printer paper are makin' a one way trip today. 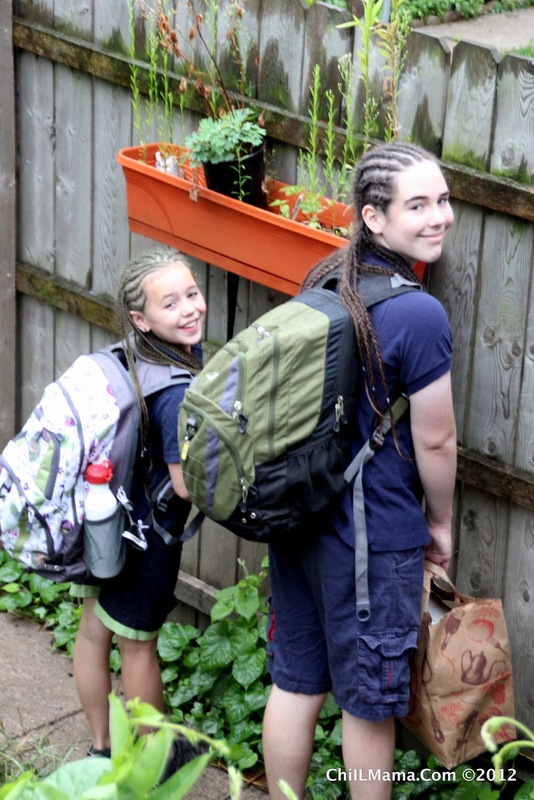 Like the kids' sweet braids? We went to Pivot Point Beauty School and they did a great job on both kids. 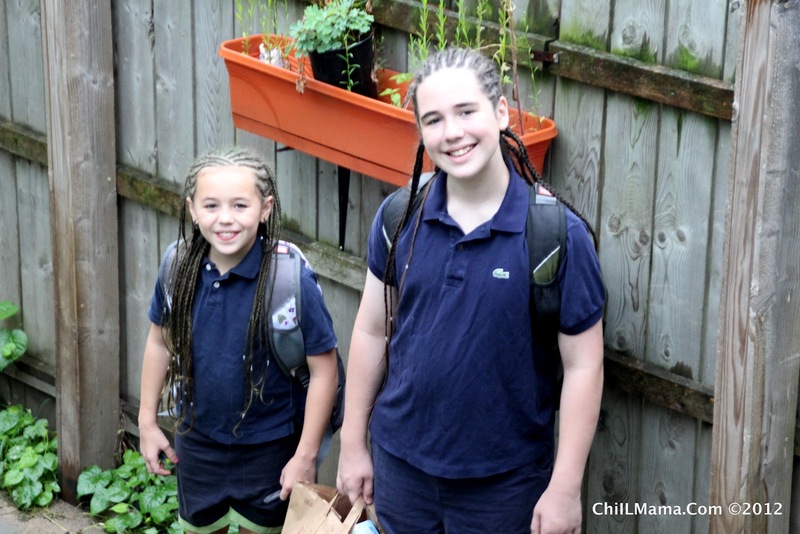 Du-Jay, my 11 year old, is rockin' 11 braids and Sagezilla has twice as many. Their prices for kids styles are sooo reasonable we gave 'em more than a 100% tip and it was still cheaper than anywhere else around. It's been so easy to care for, and with 3 of us in the family with thick hair down to our waists, I'm loving skipping the morning brush battles and painful hair drama. Hope the mini braids stay in for months! We've made the rounds for the school supplies including K-Mart, Costco, Target, 5 Below, Dollar Bills, and we're still looking for a funky, fun clip board. Later this week, I'll be joining a bunch of bloggers at Mastro's Steak House as a guest of K-Mart, and I'll have more tips on the latest back to school offerings.